Unlike many other infrared saunas available on the market our Full Spectrum Infrared Sauna offers carbon/ceramic low-EMF far infrared heating technology on the back wall, side walls, behind the legs, in the floor and front heaters. This is the only sauna with the lowest EMF and ELF levels. 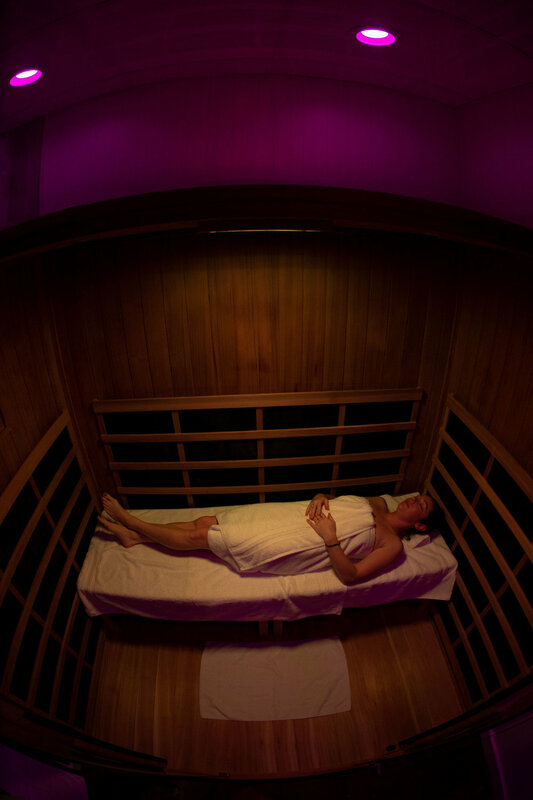 Not only can our infrared sauna be used for relaxation, rejuvenation and detoxification but it can also be your own personal hot yoga room or stretching space. Grab your yoga mat or foam roller and experience infrared heat deeply penetrating the muscles and fascia making them more pliable for a deep stretch, massage or slow flow. With medical grade chromotherapy, bluetooth speakers and a built in charging station for you tablet or smartphone, this is your opportunity to escape, recover and achieve deep healing on a cellular level. Your first sauna session is 50% off! Click here to receive your promo codes. When you book your infrared sauna session, you’ll have your own private room for 45 minutes. You’ll be provided towels, water, and have the option of showering off after your session in our luxurious rain shower complete with Omica Filter to eliminate pesky city water toxins (because you just spent all that time detoxing, why would you want to absorb more!?) Please allow for enough time to shower and change as extra time in the room delays other guests. This allows for 30+ minutes in the sauna and extra time to shower/change OR 45~ minutes in the sauna if you will not be showering.